This is for the prize draw as featured in ITV champions league coverage of the 2012 / 2013 – it’s an awesome sports prize for 4 people to 4 top sporting events! Be at the 2014 Monaco Grand Prix! 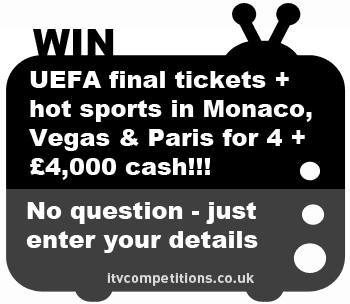 You can enter the Champions League competition up to 6 times per telephone number provided at itv.com competitions. If you’re crazy about sport & you like a bit of luxury travel then this is the prize for you! So the UEFA Champions League is upon us once again and the lovely people at itv have a a fantastic competition for you to enter in association with Master Card. This ultimate sports package could see you and some special friends jetting off to various sporting events throughout 2012. Although jet-setting to sporting events is fun (especially when it’s Vegas), you’ll probably be most impressed with the opportunity to win tickets to the UEFA Champions League Final at Wembley. Use the online entry form via itv.com for your six free entries. And, if you fancy a bet, Paddy Power are offering you a £20 bet with a £5 deposit AND they will refund you if there is a draw (UK matches). See below for details. IF UK TEAMS DRAW IN CHAMPIONS LEAGUE! decided to reward new customers with a FREE £20 Bet (please note: this offer is available on any sports market) & a quality special in order to enhance your enjoyment further! Paddy Power’s Money-Back Specials mean that even if your bets a loser, you can still end up getting your cash back! If any of these matches end in a draw, Paddy Power will refund losing First Goalscorer, Last Goalscorer, Correct Score & Scorecast singles on that match!